When the weather starts warming up in spring, we get inspired to lose a few pounds so that we’ll look great when it’s time to get into a swimsuit. But that plan often goes awry when summer begins. Longer days bring vacations and celebrations—and extra opportunities to eat enticing treats (often sweet) that pack on weight. Next thing you know, those five or ten pounds are right back where they started. If this scenario sounds familiar, it’s time for a summer diet reboot to get you back into your bikini. Cut the Carbs, Up the Fiber to Kick Off your Summer Diet Reboot! Eat a vegetable egg scramble for breakfast, a salad topped with chicken for lunch, and a salmon filet with a side of green veggies for dinner. Eat high-protein snacks in between meals to keep your cravings down. If you’re in a hurry, a high-protein, high-fiber meal replacement shake will keep you going without cravings. If your gut bacteria are out of balance, they could be making you fat. (I wrote a whole book on this topic. If you haven’t read The Skinny Gut Diet yet, check it out.) Good health begins in the gut. If you don’t have enough beneficial bacteria, called probiotics, in your gut, your health—even your weight—could be affected. Eat foods rich in probiotics, like low-sugar yogurt, kefir, and fermented vegetables, as well as foods rich in prebiotics, like leeks, garlic, onions, and asparagus. You can also take probiotic and prebiotic supplements to replenish good gut bacteria. Summertime is fun time. You will likely attend at least a couple parties before summer is over. And if parties feel like an open invitation to eat whatever delicious morsel you encounter, you’ll want to come prepared. Before you leave for your next party, be sure to eat a high-fiber snack or meal replacement shake to fill you up so those tasty treats won’t look so appetizing. Parties usually come with two drink options: water or sugary libations. Unless you’re sure you can make it through a whole party on water alone, I recommend bringing a low-sugar option. I love mixing carbonated water with a splash of pomegranate juice and a squeeze of lime. Fill up a pitcher and bring some to share. You could also brew a refreshing herbal tea and bring a pitcher on ice. If the party is sure to offer beer or sugary margaritas, you can bring a low-sugar option. 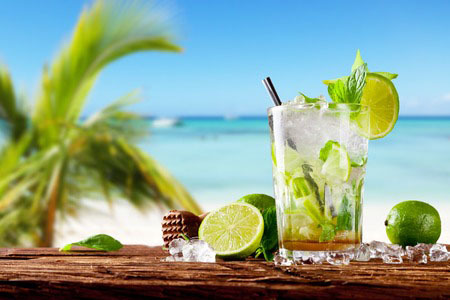 Create a delicious mojito by mixing six ounces of club soda, six ounces of lime juice, three tablespoons of crushed mint, and six servings of liquid stevia together in a pitcher before you leave. At the party, add 12 ounces of white rum and pour over ice. Salud! If you have fallen out of the habit of exercising, now is a great time to get back in gear. Regular exercise not only helps to keep you trim, it puts you in a good mood. Even a moderate walk can change your outlook. You don’t have to take on a complicated workout schedule, but you do need to get your body moving on a regular basis. Take a walk around the block after dinner. Skip the elevator and take the stairs next time you get the opportunity. Grab a set of weights and pump some iron when you need a break. Better yet, grab a workout buddy so that you can motivate each other and have some accountability. One of the best ways to motivate yourself to stick with a new habit is to remember WHY you want to adopt it in the first place. So to motivate yourself to lose weight, think about why. Sure, you want to look good in a swimsuit, but dig a little deeper. Most likely you’ll find that you want to be healthier. And why do you want to be healthier? It might be so that you can live longer to spend time with the people in your life who mean the most to you. Or you may want to not be reliant on medications, or on other people to take care of you, as you get older. Or you may simply want to feel good again. Once you discover the underlying reason why you want to lose weight, keep it in mind. Maybe you post a picture of your family on the fridge. Maybe you post a picture of you when you were healthier next to your computer. Maybe you post the phrase, “I feel amazing!” as the screen saver of your phone. Whatever your reason, connect to it when you can. It will keep you on the right track.